You're receiving this newsletter because you visited the Tiare Films stand at a wedding show, or you signed-up at the Tiare Films website. Having trouble viewing this email? View it in your web browser. In this newsletter we'd like to introduce a couple of wedding services that are certain to add some extra magic to your reception. Their free-standing photo booth is totally automatic and can be set-up almost anywhere. The press of a button takes four consecutive photos that are stored for later viewing. A photo strip can also be printed (with personalised wedding details) for your guests to take home. From off-the-cuff messages to impromptu antics, these candid pics add a whole new dimension to your wedding album. 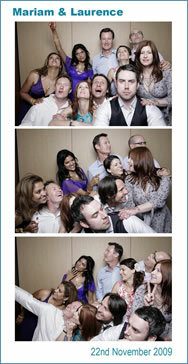 You can hire the photo booth starting at $100/hr, including setup. For more info see the Photobooth Fun website. Ever considered a breath-taking aerial performance to entertain your wedding guests? Maybe a hands-on introduction to circus skills as part of a hen's party? Instead of a first dance, perhaps you picture yourself centre-stage, wowing your guests with a doubles acrobalance routine? 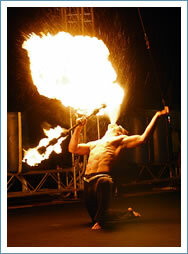 If this sounds like you, then Fuse Circus are the people to help you create a truly memorable wedding celebration. Indoors or outdoors, Fuse has a range of skills and characters, from stilt-walkers to acrobatics, hula hoop or contortion, through to amazing aerial acts on tissu, trapeze and much more! For inspiration, see the Fuse Circus website. Breath-taking performances to entertain your guests. If you're planning a 2010/2011 wedding or looking for last-minute ideas, then check out the North City Wedding and Bridal Expo. Te Rauparaha Arena will host over 100 professional wedding exhibitors (including us). An exclusive bridal fashion shows run at 11:15am and 3:15pm. You could even win a dream wedding package. For the recently-wedded, there's the New Zealand Regional Bride of the Year competition. Finalists have the chance to win prizes and feature in the highly-anticipated Rock Fashion Show. Entries close 18 Dec.
North City Wedding & Bridal Expo, Te Rauparaha Arena, Porirua City, Sun 24 Jan 2010 (Wellington Anniversary weekend), 10am-4:30pm. Given the recent decline in the weather, now's a great time to check out the tropical weddings highlights films on our website. We’d like to thank Andrea & Nick, Mary & Api, and Hannah & Shaun for letting us share their weddings with you. From circus performances to heartfelt songs and speeches, film is the best way to capture the magic of your wedding day. To arrange a free consultation, contact Justine Flanagan, +64 4 3800 800 / justine@tiarefilms.com.